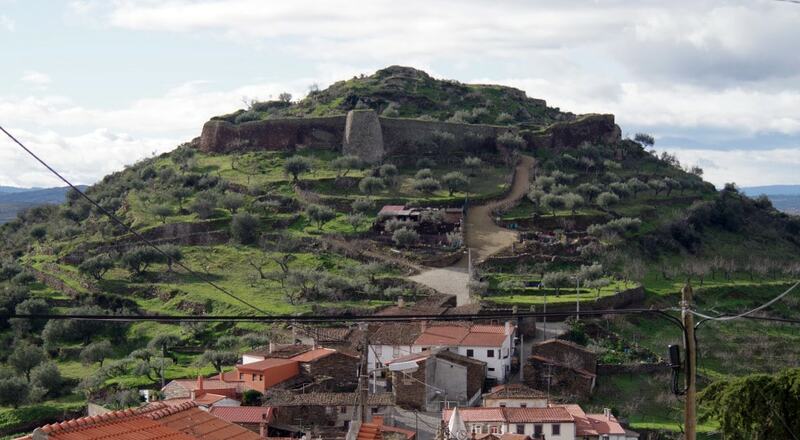 The Castle of Castelo Melhor is one of the best examples of secondary medieval fortresses, erected in one of the more peripheral zones of the peninsular kingdom. The castle is situated in a rural region, 450 metres above sea level, overlooking an urban settlement on the right margin of the Coa River.Its courtyard is built on the rock covered surface integrating large boulders. The castle follows an irregular polygonal form on the hilltop. The damaged walls consist of small schist stone with 3-6 metres without merlons and access staircase to the battlements, with a triple arch gate in the northwest. A circular tower is located adorsed to the northern wall. Between the gate and tower are the vestiges of a reinforcement wall, similar to a structure along the south wall, that indicate the former-existence of a barbican.